Fall may mean cooler temperatures and increasing rainfall, but birds still need access to baths for drinking and bathing. Properly caring for fall bird baths will not only provide essential water, but will help attract migrating birds and make any autumn yard more bird-friendly. Though natural water and precipitation may be more abundant in fall, birds also need more water at this time of year. Water is essential to keep birds hydrated and in good health during migration, and molting birds need to bathe more frequently to groom their feathers and keep their plumage in peak condition. Summer droughts may linger into fall and temperatures can still be uncomfortably high, particularly early in the season, making water just as critical for birds as it has been all summer long. At the same time, many homeowners and businesses are reducing the frequency and duration of automatic sprinklers as fall progresses, so birds do not have as much runoff or as many puddles to take advantage of. Fresh, clean bird baths will help all birds have adequate access to water throughout the season. Whether year-round residents or passing fall migrants are taking advantage of the bird bath, there are ways to keep baths clean, fresh and full throughout autumn. Keep It Big: Keep larger summer bird baths available throughout early fall, when more birds may be using the bath. This is particularly useful if migratory flocks descend on the bath, and even a large bath may be emptied quickly when multiple birds are bathing. Swap Bath Designs: More delicate, decorative bird baths are great for extra summer water, but durable, sturdier baths are better for fall. Avoid concrete bird baths late in autumn, however, as concrete is porous and freezing could cause cracks or other damage. Change Placement: Move bird baths away from deciduous trees and shrubs that will begin shedding their leaves in fall. Fallen leaves decay quickly and can contaminate the water, making it less palatable to birds. 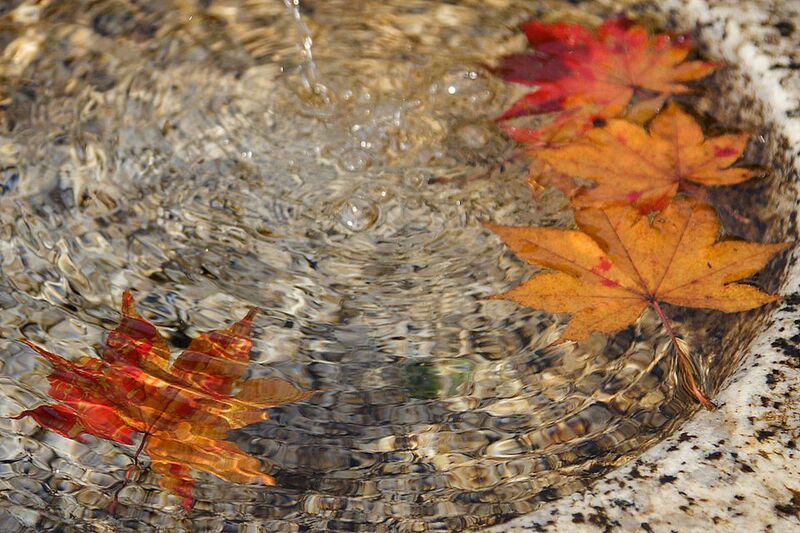 If leaves do fill the bath, they should be removed quickly. Keep It Clean: Falling leaves, windfall fruits and autumn pollen can quickly dirty a bird bath, and flocks of birds can spread diseases through dirty water. Fall baths should be rinsed at least every 1-2 days and cleaned whenever they have algae, cloudy water or discoloration. Trim Nearby Bushes: If the bath is close to bushes or trees, gently prune the plants to keep excess leaves out of the basin. This will also remove excess summer growth that could be shelter for hungry autumn or winter predators that may stalk birds at the bath. Protect It From Chemicals: If there are autumn fertilizing, weed control or insecticide treatments necessary for the yard, be sure the bird bath is covered or removed during those treatments to minimize the risk of contamination that would be toxic to birds. Add Movement: Add a dripper or wiggler to the bath to attract migrating birds with the splashes and sparkles of moving water, or try a bird bath fountain. More movement will act as an advertisement to passing birds that a good water source is available. Refill Frequently: As more autumn birds visit the bath, refills may need to be more frequent to ensure there is adequate water for all guests. A full bath will also stay cleaner for longer, and will not freeze as quickly as temperatures dip. Warm It Up: When thin sheets of ice begin to form on autumn bird baths, it is time to add a heater to the bath or take other steps to keep it liquid and accessible to birds. Moving a bath into a sunny location can help keep it liquid longer if a heater isn't available. Winterize the Bath: In late fall, take any additional steps that may be necessary to fully winterize the bird bath. This will ensure that birds always have access to fresh, clean water, no matter when the season fully changes from fall to winter. Water is critical to birds in every season, and a good autumn bird bath will be a welcome water source for year-round residents and fall migrants alike, bringing more birds to the backyard and making the most of fall migration.